Varicose veins are enlarged veins which are close to the skin’s surface. They are usually visible and can become painful particularly after prolonged standing or walking. 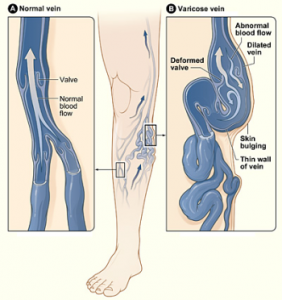 Most commonly affected veins are those in the legs and feet due to the increased pressure, which affect valves in the veins, resulting in retrograde (downward) flow of the blood. Downward direction of the blood flow (which is increased by the gravity) further damages valves, which fail to close properly, allowing pooling of the blood and stretching and thickening of the affected veins. Symptoms vary depending on the severity of the problem and may include aching legs, ankle swelling, redness, dryness, itchiness of the affected area, cramps, skin discoloration, restless leg syndrome etc. Conservative treatment includes regular rest in elevated position combined with gentle exercise and elastic stockings to support the weakened veins. The illustration shows how a varicose vein forms in a leg. Figure A shows a normal vein with a working valve and normal blood flow. Figure B shows a varicose vein with a deformed valve, abnormal blood flow, and thin, stretched walls. The middle image shows where varicose veins might appear in a leg. Sclerotherapy is a non invasive interventional procedure in which chemical sclerosant is injected, to seal off the varicose or larger spider veins (teleangiectasiae). This therapy can be used for vascular and lymphatic malformations, particularly in children and younger people. 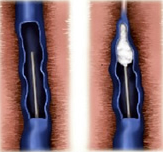 Ultrasound-guided sclerotherapy is performed by injecting of the sclerosant solution, which causes irritation of the vein and forms a thrombus. The organism itself will try to repair the damage by forming scar tissue, which will actually close the treated vein. Sclerotherapy is more appropriate for smaller varicose veins due to the fact that if instead of forming the scar, the thrombus gets dissolved, varicose vein may reopen. Sclerotherapy is used for treatment of larger spider veins (enlarged intracutaneous veins) which are usually asymptomatic, but can cause burning pain, though it seems that the major issue is of an aesthetic nature.